1. Let’s start with government. The city of Ithaca passed revisions to its cell phone tower law reducing the no-build fall radius from 200% of height, to 120% of height. 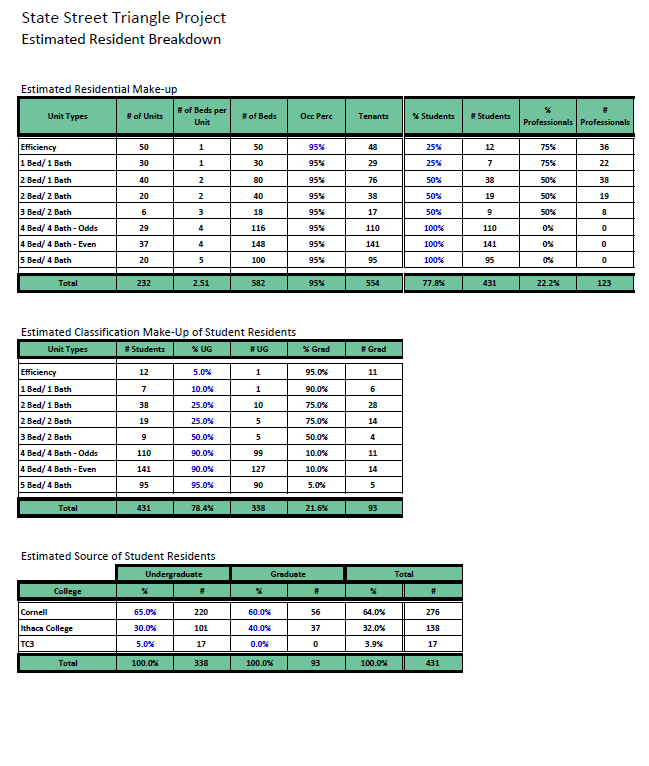 The 120% was decided upon after a check of other municipalities, where it was generally the most common figure. The change allows development to proceed on the grassy field at 815 South Aurora Street on South Hill, although as mentioned last week, the fall zone revision isn’t as much as developers Todd Fox and Charlie O’Connor had hoped for. 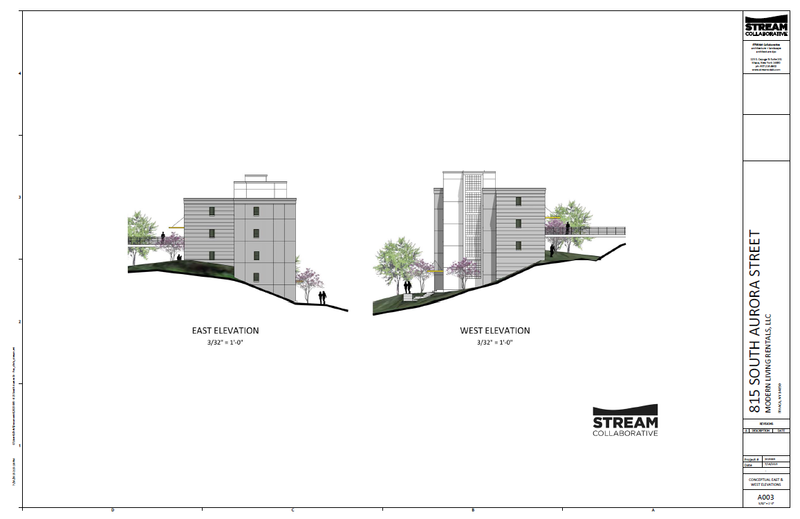 But it’s still enough to work with; according to Josh Brokaw at the Times, a revised plan that meets the new guidelines could be going to the planning board for sketch plan review in June, possibly with more units than the 87 studio units initially planned. It was also reported that the local neighborhood group (South Hill Civic Association, SHCA) is comfortable with the initial plan, so this might be a relatively smooth process when the project is ready for review. 2. Meanwhile, while one thing moves forward, Dryden’s been hit with a major setback. The Pinckney Road parcel sale in Dryden was foiled when voters, in a 1188-936 vote, rejected the town’s plans to use recreation reserve funds to purchase the 15 acre property. The town would have spent about $56,800 of a fund that has over $300,000, and the county would have contributed $15,000, so that the town could have turned it into park space in the long-term. The town was prepared to buy the property, but residents opposed to the sale managed to get enough signatures on a petition to force to to go up for a vote. It sounded like a worthy and reasonable plan. But I get the feeling that there were a lot of folks who figured it would pass by a wide margin, so they just didn’t vote. In a marketing course a while back in college, I remember the professor sharing an interesting statistic – versus feeling neutral, the general public is three times more likely to support an initiative when they really like something, and nine times more likely to vote or speak out when they’re really opposed. People are more driven by aversion than reward, and that’s probably what happened here. 3. 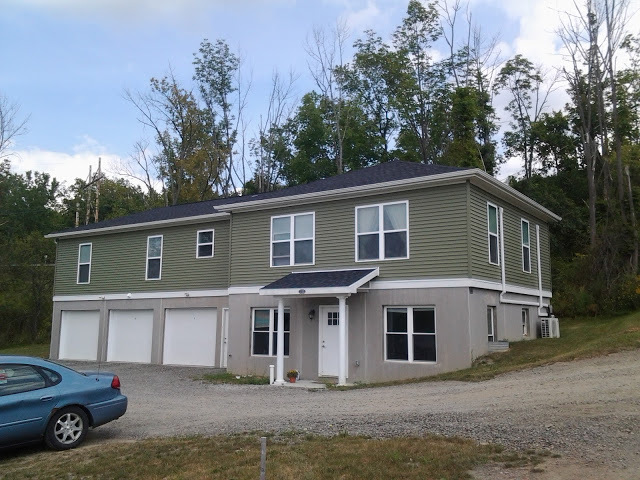 Sticking with local governments, the town of Ithaca is set to vote on a moratorium on duplexes, but with some modifications from the initial proposal. For one, given construction seasons revolving around the warm season, and the time it takes to plan and get permits, it was decided to make it only nine months (January 2017) instead of one year, so that they could limit the possibility of dragging it through two construction seasons. And although the town planning committee chair wasn’t on board with it, an exemption is in place if one of the units will be owner-occupied. If their goal is to revise the approach to student housing, then at least these amendments fix or lessen some of the bigger issues a moratorium would produce. 4. Just a wee bit more info on the “Tim Timbers” planned for the corner of Freese and Dryden Roads in Varna. The tiny houses are small though not micro-sized – they’re expected to be about 800 square feet. Local architecture firm STREAM Collaborative is working with businessman Nick Bellisario on the 16-lot subdivision and home development. 5. So the full 206-page, $78,000 NYS DOT waterfront redevelopment study by Fisher Associates is on the city’s website. The initial results were shared here back in October, but the final product has some additional, very interesting details. One of those additions is a potential timeline for development. It calls for getting official support and commitments over the next several months, issuing an RFP later this year for the new DOT facility in Dryden, and issue an RFP for the NYSDOT waterfront site later this year, with review in Q1 2017 and developer selection in Q2 2017, assuming this doesn’t end up like the Old Library debate. The DOT would move to Dryden in Q3 2018, and the excess state land would be transferred to the county, sold in Q1 2019, and ready for occupancy by mid-2020. The other really interesting new section is Appendix 5, stakeholder outreach. This consists of interviews with city officials and nearby property owners – Cornell (who say they have no plans for their waterfront properties), the Farmer’s Market, and some smaller businesses and organizations. The gist of the comments had more to do with Farmer’s Market than the DOT – namely, heavy traffic issues, needs more parking, and needs to physically expand to accommodate a waiting list of vendors and cool-season operations. There are early plans incubating for a nearby indoor market facility, if memory serves right. 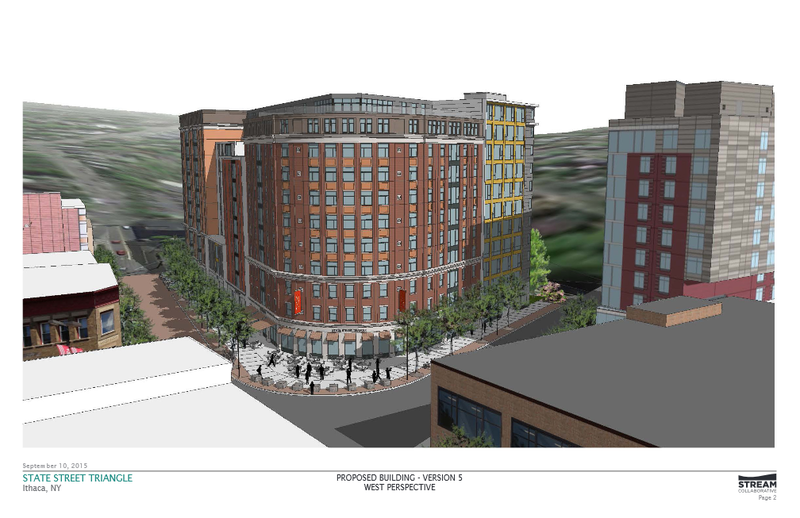 As for the DOT site, the mixed-use plan was deemed most favorable, and the stakeholders agreed that the site had great potential for redevelopment. 6. Looks like marketing has started for a proposed new medical office building in the village of Lansing. The new one-story building, which appears to be designed by Binghamton-based Keystone Associates, would be off of Warren Road, although it looks like the building would be accessed from a driveway coming off of Uptown Road. The 2.71 acre property is zoned “Human Health Services District” by the village, and borders undeveloped land owned by Cornell, and several other suburban medical office buildings built over the past few decades. 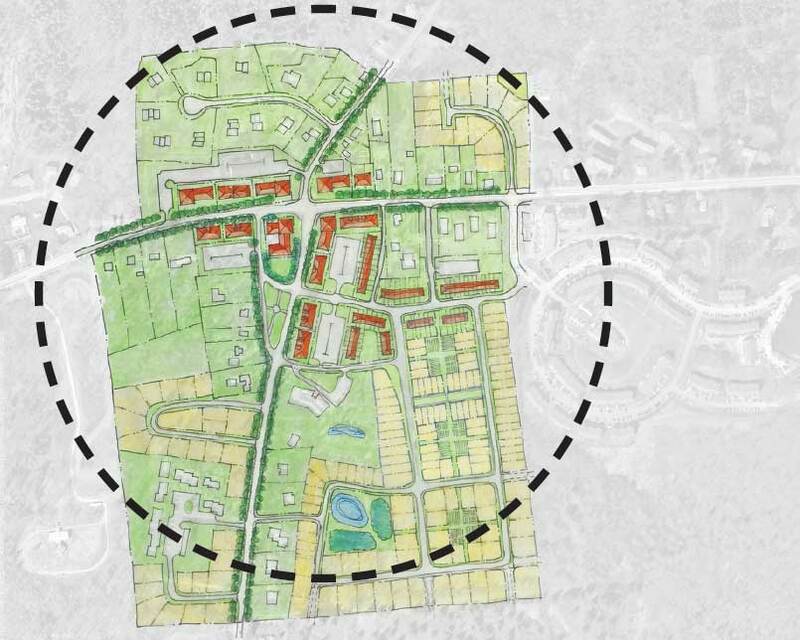 The resolution on the attached site plan is too low to determine the square footage, though it looks to be in the low tens of thousands. The property was purchased by Arleo Real Estate from Cornell for $378,600 in October 2014. Arleo Eye Associates owns and occupies the neighboring building to the south. Arleo built their 7,119 SF optometry office in 2007. 1. It isn’t exactly a shock that Elmira Savings Bank is pursuing plans for the $1.7 million in properties it just acquired on the west 100 block of Meadow Street between West State and West Seneca Streets. That being said, sending out 30-day eviction notices wasn’t a very good idea from a public relations standpoint. Technically, it’s all above the law – the three tenants affected were on month-to-month leases, according to Nick Reynolds over at the Journal, and one had an expired lease and was in the process of relocating. The bank wasn’t interested in renting out the properties and decided to clear them out. That is plausible, if a little brusque – even if they had put forth a proposal for something at the next Planning Board meeting, approval would take months, in which case they could eased the tenants out of the current property. But instead, they ended up with a petition that, while mostly reading like a speech from the Politburo, does make the valid point that this was conducted poorly. Then it hit the airwaves, and the bank has gone into major damage control mode, giving the tenants until the end of March and reimbursing them $1,000 for the trouble. Looking at some of the comments on the Voice, there is a lot of outcry against gentrification, but there’s not a whole lot the city can do to prevent that – even if Elmira Savings Bank didn’t build a thing and sold the buildings to someone else, the rapidly rising property values around the city would push the renters out, albeit more subtly, and the city can’t make a law that says someone can’t move in. Plus, as seen during the 210 Hancock, Stone Quarry and Cayuga Ridge debates, there’s a lot of pushback locally against affordable housing. Arguably the best solution going forward is to work an inclusionary zoning ordinance into law so that when Elmira Savings Bank does decide to build (and it’s more of a when than an if), that a few of the units be made available to those on more modest incomes. Just to touch on that real quick, according to the Journal, the old Pancho Villa building at 602 West State Street will become a bank branch for ESB in the short-term, and plans are being considered for a mixed-use project at some point down the line (two months, two years, who knows). 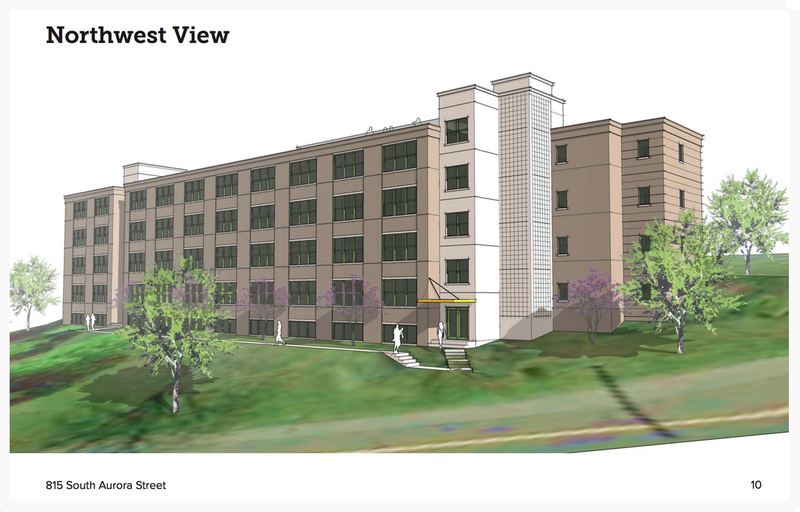 The zoning is WEDZ-1a, allowing for a five story, 65′ building, but there might be tweaks to that depending on the inclusionary zoning ordinance. 2. Keeping a focus on the west side of the city, the Planning and Economic Development Committee voted to circulate a proposal for a “Temporary Mandatory Planned Urban Development” (TM-PUD) over the waterfront. The reason for this is one part proactive, and one part reactive. What the TM-PUD does is, for an 18-month period starting the day of Common Council approval, it gives the Common Council the right to oversee and if necessary vote down projects that it thinks will not be appropriate for the waterfront. The study area is currently a mix of zones: Waterfront (WF-1, WF-2), Southwest Mixed-Use (SW-2), Park (P-1) and Industrial (I-1). When the Comprehensive Plan was passed in 2015, it promoted a more walkable, dense, mixed-use waterfront. Therefore, some of the zones are outdated. The city’s planning department is still in the process of drawing up specifics for how to implement the Comprehensive Plan’s walkable urban waterfront, but in the meanwhile, some of the zones don’t match up with the direction the city wishes to proceed. Take, for example, the industrial space on Cherry Street and Carpenter Circle. By zoning, residential uses aren’t allowed, although the city would like to see mixed-uses with condos and apartments in their vicinity. The planning department needs time to figure out the what and where on zoning so that those uses can be proposed without a developer spending extra months in front of the Planning Board and BZA, which can drive up costs and make construction financing more uncertain. So that’s the proactive, benign part – the city needs time to plan out the zoning laws for the dense waterfront they want. Now comes the reactive, cynical part. It’s a not-so-secret secret at this point that the Maguires are looking hard at Carpenter Circle for their car dealership headquarters and multiple sales outlets. Since Carpenter Business Park is zoned industrial, and Ithaca city zoning allows commercial uses in industrial space so long as they’re two floors, there’s a good chance they could build dealerships without the need of the BZA, and it would be an uncomfortable position for the planning board to have to debate a project that is totally legal but is something the city and much of the community doesn’t really want. So as a way to stall for time, the city’s pursuing this TM-PUD and giving the Common Council the authority to shoot down any unwelcome plans should they arise. For comparison’s sake, there’s a similar scenario that is playing out in Ithaca town. 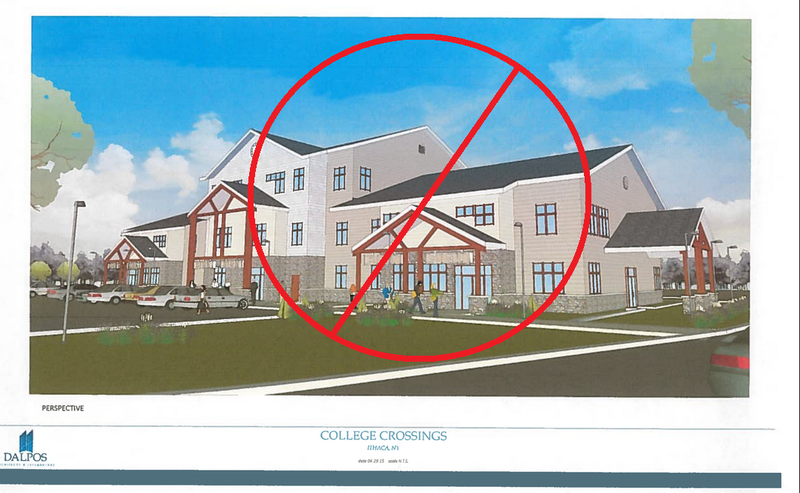 The College Crossings project on South Hill was welcomed under the zoning and previous iterations had been approved, but after the town passed its 2014 Comprehensive Plan and attended the Form Ithaca charettes last summer, the planning board realized that a shopping center with a couple apartments above and in the middle of a large parking lot wasn’t something they really wanted anymore. 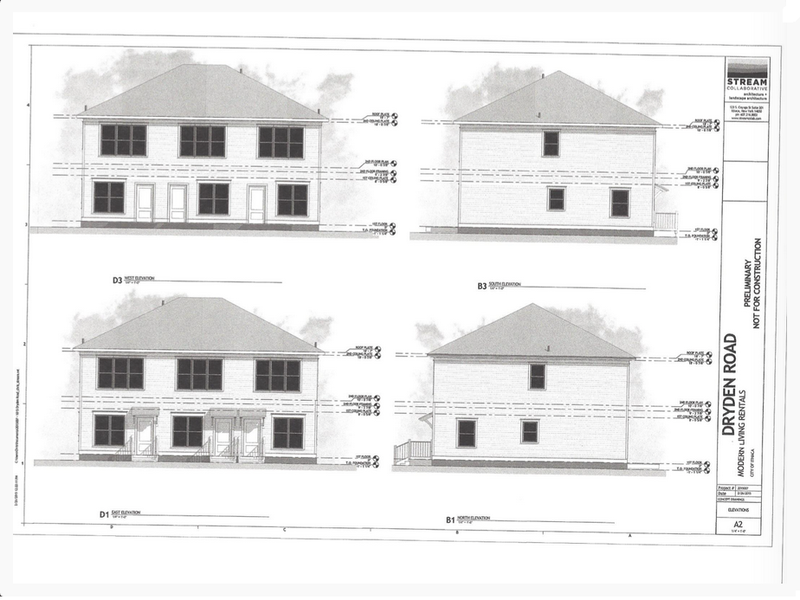 While the project has been withdrawn, the process and debate has created a lot of discomfort, confusion and uncertainty, which is rather problematic given the area’s housing shortage. The town hopes to have some form-based zoning code ready this year. So, looking back to the city, the occupants of 108 E. Green Street want things that are still illegal in much of the study area, but they don’t want a full-on moratorium because some spots like the Waterfront zones actually do accommodate what the city and many of its constituents want. The TM-PUD is an attempt to stave off the legal but undesirable projects until the revised West End zoning can go into effect. Worth pointing out, at the meeting the boundary was changed to midway through the Meadow Street and Fulton Street blocks, rather than along Fulton Street. It may or may not affect Elmira Savings Bank’s parcels as mentioned above, but those long-term plans are in alignment with the city’s, so probably not. 3. On a related note, the town is holding workshop sessions for those interested in designing a ped-friendly, mixed-use community for South Hill. The meetings are planned for 6:30 p.m. to 8 p.m. Jan. 26 to 28 at the Country Inn and Suites hotel at 1100 Danby Road in Ithaca. An open office has also been scheduled for 12 p.m. to 1 p.m. Jan. 27. Form Ithaca will be in attendance at the sessions to help formulate the form-based character code proposed for the neighborhood. 4. A revision to the cellphone tower law has taken one step closer to becoming reality. The city’s Planning and Economic Development Committee voted 4-1 to circulate a revised law that would reduce the size of the tower’s fall zone, where construction of any structures is prohibited. 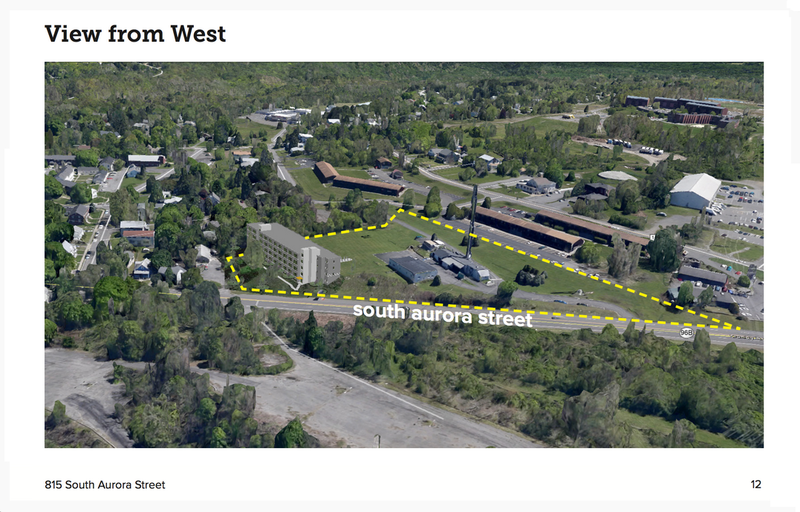 A revision to the current city law, which is twice the height of a tower, could potentially allow the 87-unit 815 South Aurora apartment project to proceed with planning board reviews and other BZA variances if necessary. Developers Todd Fox and Charlie O’Connor of local company Modern Living Rentals have been pushing for a fall zone radius of 180 feet for the 170-foot tall tower, rather than the 340 feet as the current law mandates. From the discussion, it sounds like the concern has less to do with this parcel, and more to do with the possibility of cell phone companies pursuing towers on open land in the northern part of the city where spotty reception has to be weighed against the aesthetics of the lake shore. Anyway, we’ll be hearing more about possible changes to this law in a month, but for back reading, here’s the Voice article from a few months back. 5. In quick news, CBORD’s move to the South Hill Business Campus looks like a go. A $2.45 million construction loan was extended on the 8th by Tompkins Trust Company. CBORD, a software company founded in Ithaca in 1975, will move 245 employees into 41,000 square feet of freshly renovated SHBC space from the Cornell Business Park later this year. The project, which totals $3.7 million, was granted $296,000 worth of sales tax abatements. 6. From the city’s Project Review Agenda next Tuesday, plans for a facadectomy of the 1980s Student Agencies Building at 409 College Avenue. Student Agencies, in collaboration with Cornell, plans on dropping $183k on the facade work, as well as the $2.8 million or so for the interior renovations of the second and third floors for the new eHub business incubator space. Prolific local architecture firm STREAM Collaborative is in charge of the design work, including the 9,660 SF of interior space. The work would go from January to April (the loan is already approved and most of the work is interior). If I may play armchair architecture critic, which I have no credentials to do, I think the patio area is great, but I’m opposed to the brise-soleil, the wing like feature that serves as a sunscreen. I feel like that its location above the third floor throws off the rhythm of the block, by being lower than the cornices on adjacent structures. It might be fine over the glass curtain wall alone, but as is it feels a little out-of-place. Just one blogger’s opinion. 7. House of the week. 228 West Spencer Street in the city of Ithaca. Zero energy new construction, 2-bedrooms, on a rather difficult site. In the above photos from last weekend, the house has been framed and sheathed with Huber ZIP System plywood panels, the roof has been shingled, and doors and windoes have been fitted. The blue material on the concrete basement wall is Dow Styrofoam Tongue and Groove Insulation which protects against moisture and helps keep the heat loss to a minimum. The house should blend in nicely with its neighbors. Ed Cope of PPM Homes is the developer, and Noah Demarest of STREAM Collaborative is the architect. 1. College Crossings is dead. But its passing opens up an interesting conversation. According to Ithaca town planning board minutes uploaded earlier this week, developer Evan Monkemeyer withdrew his proposal after planning board members weren’t comfortable with approving the environmental assessment and mitigation plan for the proposal (technically called a “negative declaration” by the lead agency on the SEQR). 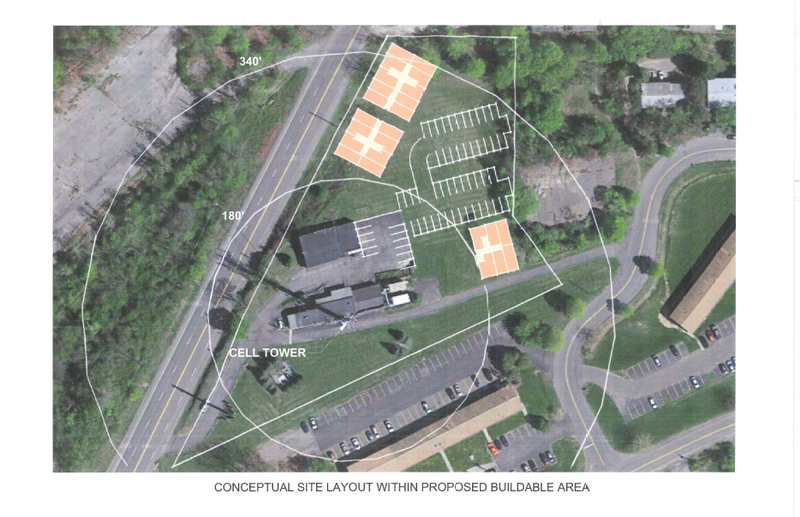 While at least one was bothered by the 3-story, 54′ height, many board members had visions of the Form Ithaca charrette for the property, and this didn’t quite jibe with Monkemeyer’s plans for South Hill’s King Road and Route 96B/Danby Road intersection. Minutes for the July and August meetings can be found here. Now, I will gladly admit that I was not a fan of this project, and I too wanted something more along the lines of Form Ithaca. I’m surprised, though, that it was enough to derail approvals of the project. 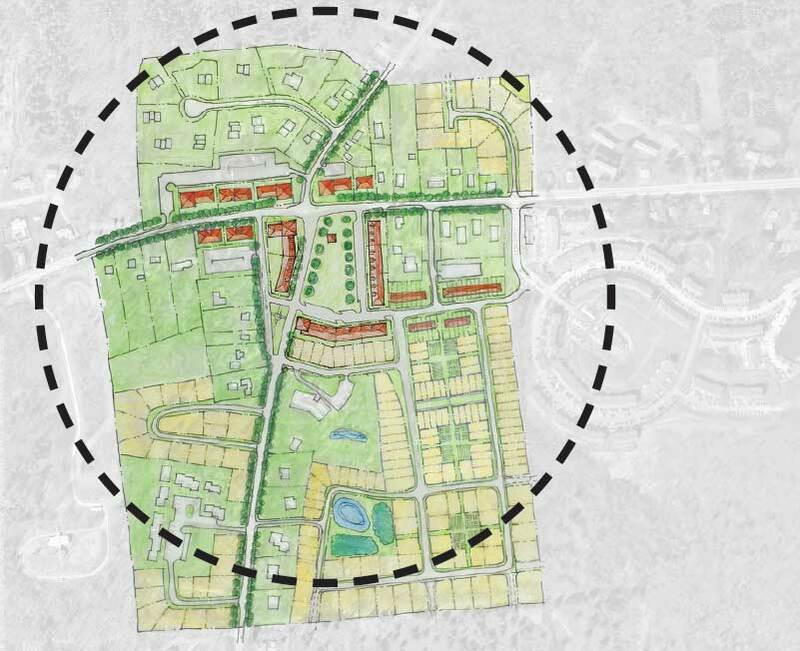 Now, the problem is, the town’s new comprehensive plan embraces form-based codes and “Smart Growth”, but the zoning is auto-centric, outdated, and doesn’t mesh with the plan. If you’re a developer or builder, big or small, and what’s legal and what the town wants are two very separate things…Houston, we have a problem. At this point, there’s two questions that come to mind – one, given that the town planning board has cancelled most of its meetings lately due to a lack of proposals, is the disconnect between plan and zoning halting projects, and two, when will revised zoning be ready. For guidance and knowledge, I reached out to town of Ithaca assistant planning director Dan Tasman, because he’s pleasant, responsive and a pretty great guy. As for question one, here’s his quote: “Seriously, I think it’s … complicated.” His thoughts were that there’s no indication whether the recent slowdown were caused by the planning/zoning disconnect, or natural ebb and flow related to lending and planning on the ends of home-builders and developers. He’s right about the town not growing that fast. The permit records show that in September, the only new home-building permit was for a duplex at 214 Pennsylvania Avenue on South Hill (the Iacovellis building more student rentals for IC, probably). The previous month online, June, had four single-family homes, filling out lots in previous-approved subdivisions. 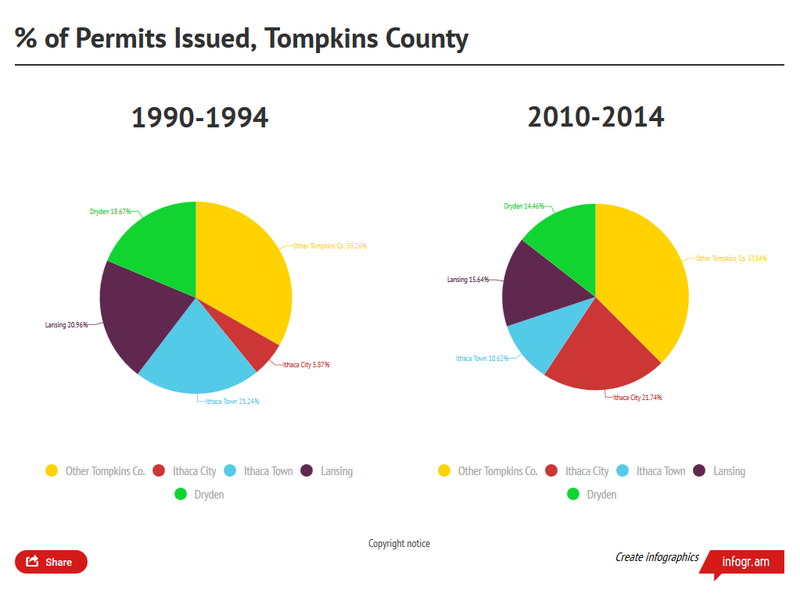 Traditionally, the town of Ithaca has made up a pretty sizable chunk of the new home permits in the county. But if they only issue 30-40 this year (still better than last year’s 14), then it falls on the rest of the communities to try and make up the housing deficit, at least in the short term. Ithaca city’s total, anticipated to be 247 new units to be permitted in 2015, is only about 84 units right now, because John Novarr has yet to start Collegetown Terrace’s Phase III, and Steve Flash’s 323 Taughannock on Inlet Island has yet to start either. To bring down the deficit in a decade, as well as keep up with annual economic growth, the county would need over 600 units per year; it’s not certain if the total will reach even half that in 2015. On the one hand, the town of Ithaca is trying to be proactive and adopt a new approach to development in quick and good order. On the other hand, it’s not a great situation for trying to make a dent in the housing deficit, with its attendant affordability issues, and there’s the possibility things are going to get worse before it gets better. I don’t know if there’s a right or a wrong way of going about it, but it’s a stressful setup. 2. On the county level, officials are seeking legislature approval for launching a study into the feasibility of an airport business/industrial park in Lansing. 52 acres of vacant land along Warren and Cherry Roads are being considered for the study, which would include a conceptual site plan of potential buildings and parcels, and an assessment of the needs and characteristics of companies most likely to open in the potential business park. Utilities and green infrastructure will also be looked at in the study. 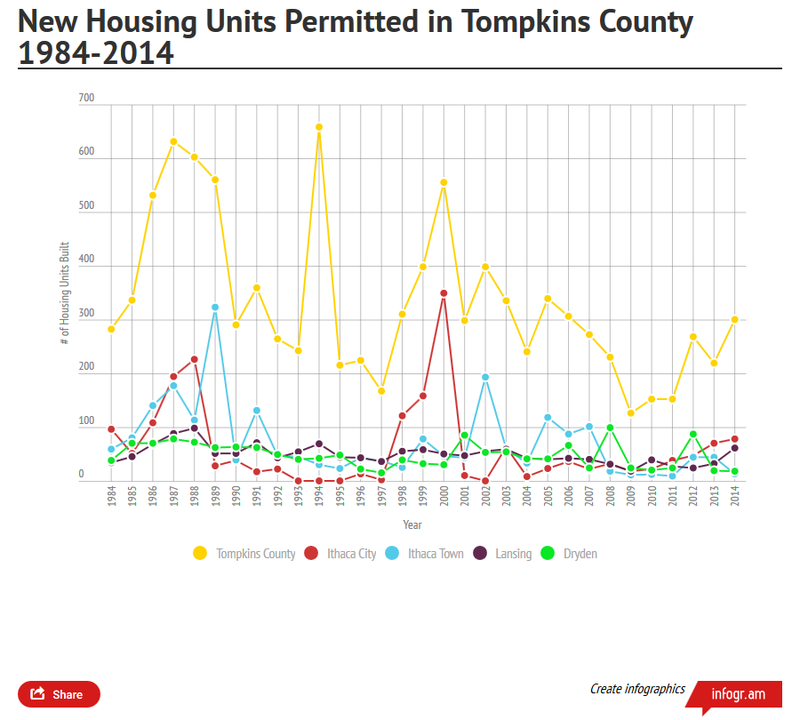 The projected cost is less than $50,000, and being paid for by the Tompkins County Industrial Development Agency (TCIDA). The feasibility study would be awarded next month, with authorization and approvals on the staff level. For what it’s worth, folks living up there are used to business traffic – Borg Warner’s 1,300 person plant is adjacent to the study site. The Warren Road Business Park lies a minute’s drive up the road, and the Cornell Business Park is about a minute’s drive south. The land also has municipal sewer, allowing for large-scale projects. 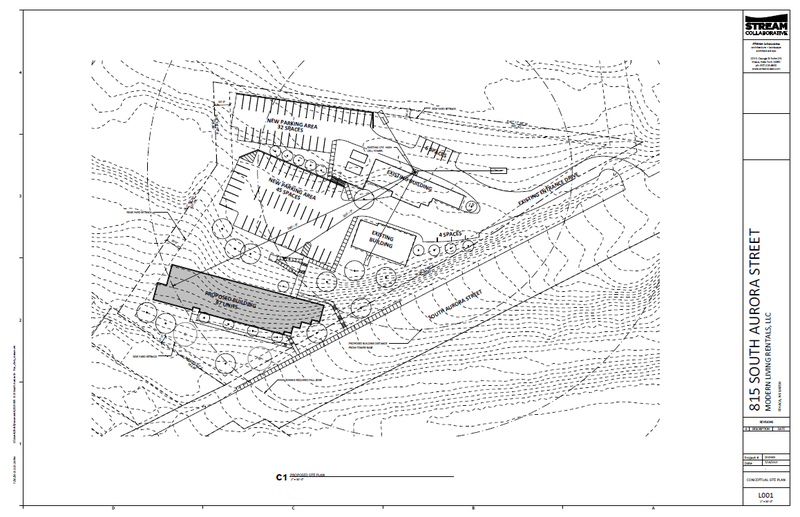 A copy of the RFP states two that the two parcels shown above are the primary analysis area, with secondary areas closer to the airport runway and the resident land to the west separate from the park. They aren’t a part of the proposed business park, but the county asks that they be examined for development potential by the study. 3. 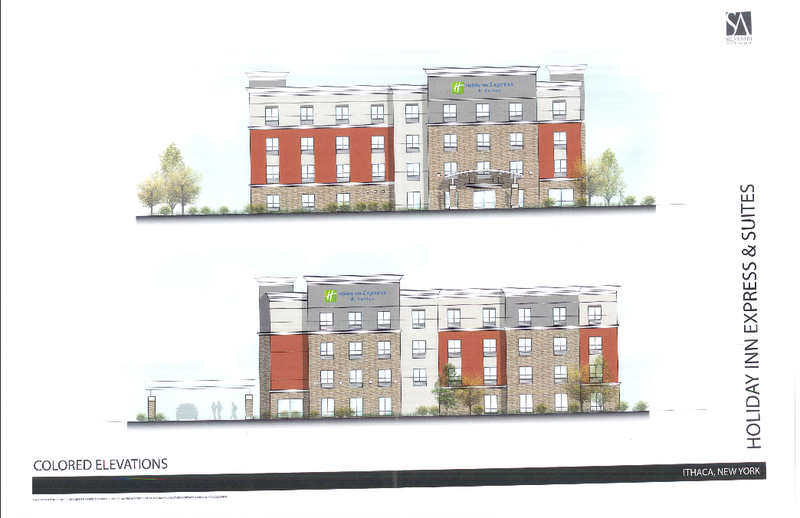 Details, details – the Holiday Inn Express already under construction in big-box land at 371 Elmira Road will be going in front of the city planning board this month for some slight modifications. The developer, Rudra Management and Rosewood Hotels of Cheektowaga, wants to increase the number of rooms from 76 to 79, and add three parking spaces accordingly. 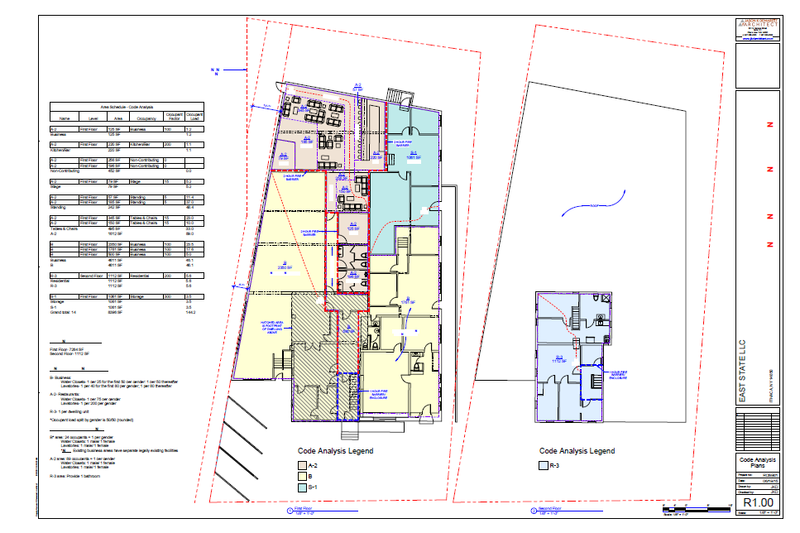 Along with that comes the bevy of supporting docs – technical drawings here, landscape plan here, landscape schedule here, and elevation drawings here. Apart from a palette change on the exterior (the red-brown color is “Decorous Amber“, part of the new official Holiday Inn color scheme per the architects’ cover letter), there are no changes to the design, the 3 additional rooms are just an update to the interior configuration of the hotel, one more room on each of floors 2-4. Apart from tastes in color and making sure the three new parking spaces pose no issues, the board won’t have to debate much here, and the hotel is still very likely to open next summer. 4. In small but notable builds, Modern Living Rentals (MLR) is at it again. The relatively new Ithaca-based rental and development company is planning a triplex (3 units) at 1015 Dryden Road, just east of the hamlet of Varna. According to an email from MLR co-owner Todd Fox, the units, all 2-bedrooms, will start construction in the spring, and it’s a safe wager they’re shooting for an August 2016 completion, just in time for Cornell student renters. Judging from the renders on MLR’s site, each unit will be around 930 SF, so about 2,790 SF total. MLR teamed up once again with local architecture firm STREAM Collaborative for the design. 1015 Dryden is also home to a single-family home built in 1938, and a 4-unit apartment building from about 1980. The apartment building was badly damaged in a fire in 2011, renovated, and the site was sold to MLR for $425,000 in March 2014. 5. While on the topic of MLR, let’s throw in some eye candy. 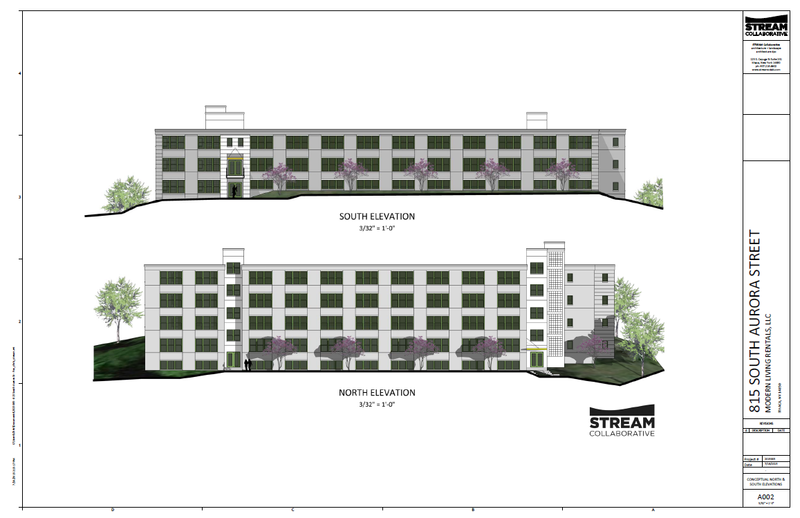 Along with the plans for 1015 Dryden, additional images for the proposed 87-unit project at 815 South Aurora Street on South Hill can be found on their website as well. 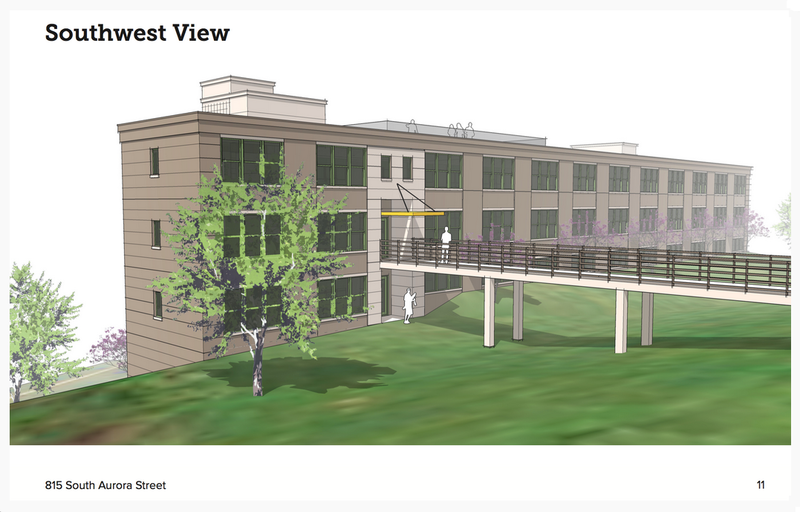 I’ve included two perspective renderings and an aerial render, but more images can be found here. The 87 units will all be studio apartments. STREAM Collaborative is responsible for this design as well. A detailed write-up of the project, including the related cell phone tower issue, can be found here. 6. Out in Lansing town, there are two attention-grabbing news pieces from Tuesday’s next planning board meeting. 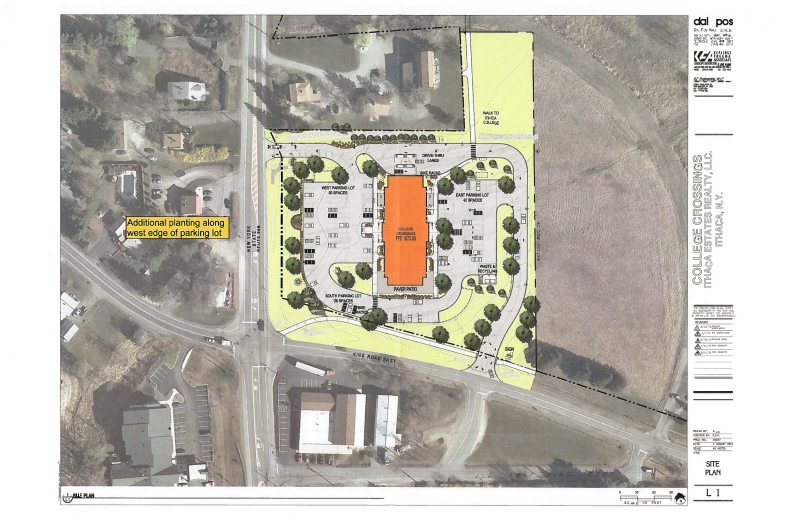 One is a plan for an LP gas / petroleum distribution facility on Town Barn Road (parcel address 3125 N. Triphammer Road). A 30,000 gallon storage tank and gravel drive are planned in the initial phase, with 5 15,000 gallon tanks, a garage/maintenance building, and an office planned in later phases. Now, normally a project like this is not a big deal, but there’s the outside possibility local contingents of the anti-Crestwood, anti-fossil fuel groups will go on the offensive to try and stop it. So the potential for political football is there. The other detail isn’t up for discussion yet, but the town notes that 15 duplexes (30 units) are being planned by former Lansing town supervisor A. Scott Pinney for a site on Peruville Road (the county calls it 428 Scofield Road, but the land has frontage on both roads). 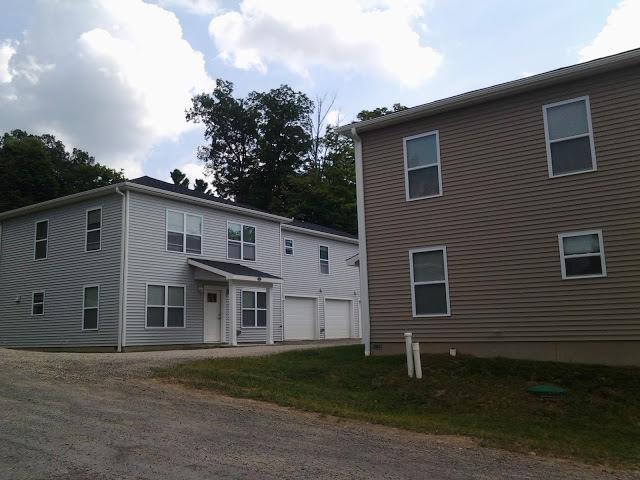 The site already houses 4 duplexes built in 2011. 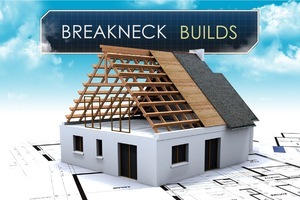 The modular home assembly was the work of local builder Carina Construction, who also tackled the modular units at the Belle Sherman Cottages site. Local builder, local resident, local project, so set your DVRs or TiVo. B. 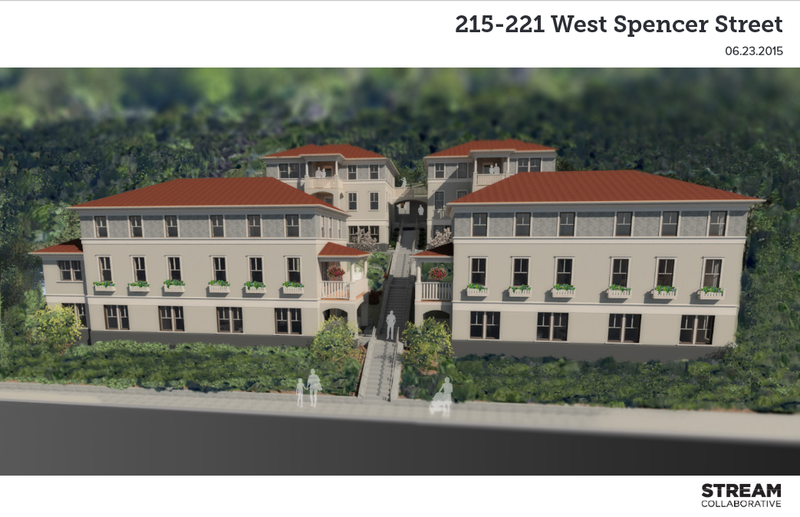 Declaration of environmental significance and BZA reccomendations for 215-221 West Spencer Street– Pocket Neighborhood, 12 units w/ 26 bedrooms, Ed Cope/PPM Homes is the developer, Noah Demarest of STREAM Collaborative is the architect. C. Environmental Review Discussion for the bar/lounge proposed for the renovation of 416 E. State – cover letter here, description here, letters of opposition in the agenda. D. Public hearing and re-approval, Hotel Ithaca renovations, 222 S. Cayuga – Site Plan Review drawings here, renders here and here. Not sure there’s enough of a difference from the first time around, but at least the cross-catching on the exterior is gone. E. Herson/Wagner Funeral Home renovation, 327 Elmira – Declaration of Lead Agency and Public Hearing – I wrote about that in the Voice here. Fun fact, the original proposed title was “Funeral home hopes to being new life to Elmira Road property”. It was rejected.